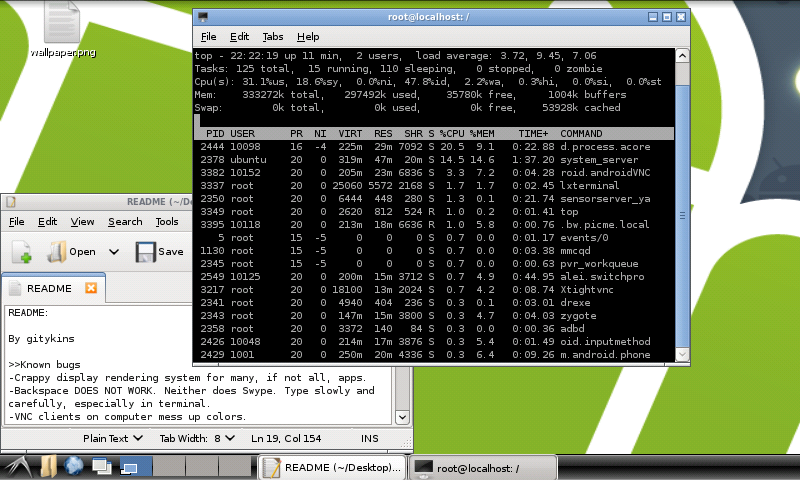 This version of Karmic (9.10) Ubuntu was made for desktops. It is not a mobile OS and has no phone/text apps. It runs as a completely separate OS that displays on your phone. 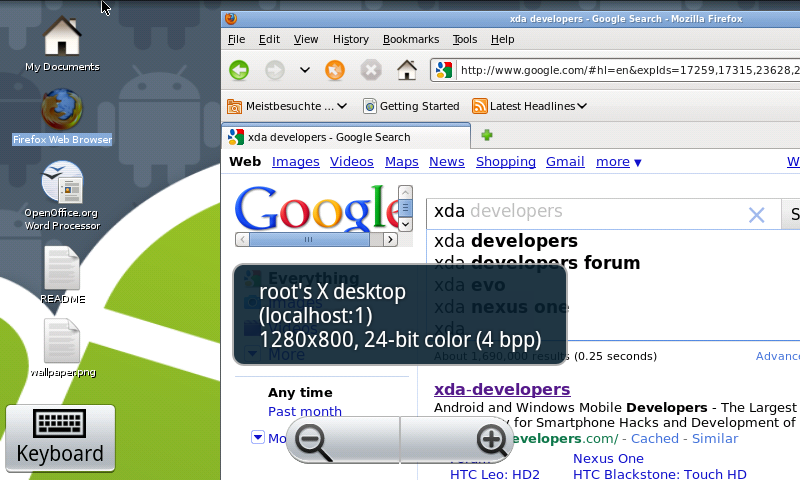 While this OS does run "natively", you can only see the lxde gui through a VNC viewer. The filesystem file stays on your sd card. Any changes made can be reversed by typing rm -rf /sdcard/ubuntu in a shell/terminal or deleting that folder from root explorer/astro. While this can do no harm to your phone whatsoever, it can freeze it and hog the cpu completely. I can guarantee that no one will keep this on his/her phone for more than a week. It is simply proof of concept. You can view the OS on your computer, but you must use WiFi. Other similar ports *cough* Vibrant *cough* lack features such as many graphical apps, but this strives to be as fully featured as possible. 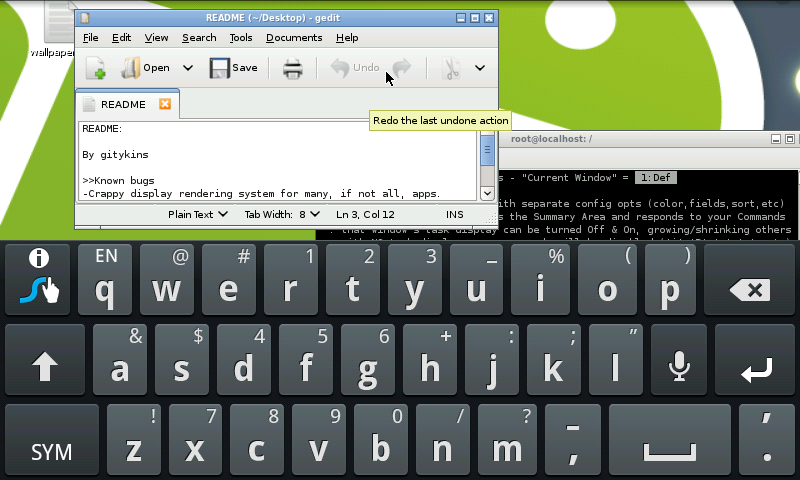 All apps should run, but don't try to multitask. It's a phone. Not a computer. This is a thinktank because it's not polished enough for me to flat out call it a release. There are many errors and crappy ways of doing things. If you want to help (I don't expect you to; it's futile and useless) run things from terminal and look at the bugs in the README on the desktop. All directions and credits are hardcoded in. If you read the outputs of the commands, you will have no problem. However, a starter's guide is below. Copy the ubuntu folder to your sd card *!THIS TAKES UP 2 GIGABYTES! * and it will take a while to copy. cat gui will give you instructions on how to set up a localhost VNC server with no network lag. Pretty snappy, a lot faster than you'd expect.